Welcome to my column where each month I’ll take a book from the shelf to share. It’s a review of sorts, but also hopefully a nudge of encouragement, to say go on – there’s a lot great reading out there! Last month I travelled to Mparntwe-Alice Springs for a writing workshop. 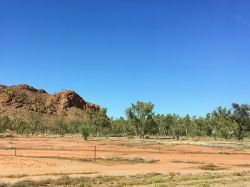 Like many visitors before me, I spent the weekend completely in awe of Arrernte country – the crisp light, the soft grey-greens and the soaring ranges. Landscape so starkly different to the Top End. 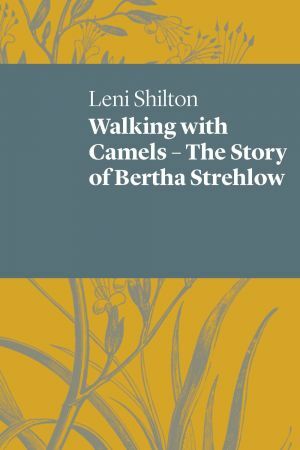 As a writer and reader it was a fortuitous time to be in the centre as I was able to attend the launch of Walking with Camels – The Story of Bertha Strehlow, a debut verse novel by poet and Alice Springs local Leni Shilton. Hearing excerpts of the work read by Mary Anne Butler at the launch, I was again struck by the intensities of the desert landscape – this time poetically conjured by Shilton and re-imagined through the eyes of Bertha Strehlow, one of the first white women to travel through Central Australia. Verse poetry is a lyrical and deeply moving way to write a biography and Walking with Camels is no exception. As well as an inscription of place, the work is also a sensitive portrayal of a woman’s love, loss and endurance. In this way, it reminded me of another remarkable verse novel, Ruby Moonlight, by Ali Cobby Eckermann – which similarly gives voice to a woman forgotten by history. Written in first-person and drawing on extensive archival research, Walking with Camels is a collection of 84 poems that together weave the story of Strehlow’s time in Central Australia – including her own camel ride across desert country, four decades before that of Robyn Davidson. The collection primarily focuses on Strehlow’s relationship with, and separation from, her anthropologist husband Ted Strehlow. Having followed Ted away from home and family – 'the sea pulls away fromme / a vast retreating tide / as the train grinds north', Strehlow’s journey is one of hardship and isolation. Walking with Camels is a beautiful book that gives voice to a woman of remarkable strength – a strength often found in women who nurture, support and placate famous men. Women so often denied their due. 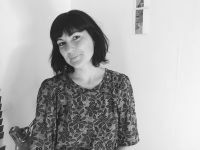 Leni Shilton will be a guest of the NT Writers’ Centre’s Wild Words festival in May.